The Debt: Sometimes Haunting Spy Thriller Ushers In The Fall! The Debt is a sometimes haunting fiction that starts out as a celebration of the publication of a book that chronicles an important moment in the history of Israel – the death of a Nazi war criminal known as the Surgeon of Birkenau. Technically, The Debt opens in 1966 with three people getting of an airplane at an Israeli military base and being greeted like heroes. The we cut to 1997, where we cut between a gathering to celebrate the abovementioned novel, and an unnamed man in an automobile watching helplessly as another man – who we assume to be a friend – step into traffic. The book was written by Sarah Gold [Romi Aboulafia] and chronicles the hunting, capture and death of Col. Dieter Vogel [Jesper Christensen], the Surgeon of Birkenau. Sarah’s mother, Rachel Singer [Jessica Chastain] and two other Mossad agents – David Peretz [Sam Worthington] and Stephan Gold [Martin Csokas] were responsible. In the present, we learn that it was David [Ciaran Hinds] who committed suicide and the man in the car was Stephan [Tom Wilkinson] – who picking David up to attend the gathering. Most of the film, though, takes place in 1966, as the three work together to capture Vogel, who is living in East Berlin where he has a practice as a gynecologist. The trio’s in to see Dr. Bernhardt, as Vogel is now known, is Rachel, who seeks his professional help because of an inability to get pregnant [her cover is as David’s wife, but all three share a grungy flat]. Her appointments are chilling because we know that this affable, middle-aged OB/GYN performed hideous experiments on Jewish men, women and children [some photos show a few of their fates]. Although she has the most dangerous role in their plan, Rachel is actually on her first mission, while David and Stephan are a little more experienced. David is the most openly emotional one of the three, while Stephan is coldly mission-focused. Rachel is terrified, but does her best not to show it. Once they have captured Vogel, the Nazi plays mind games with them in an effort to breaking their focus enough that he can find a way to escape. Christensen is silkily creepy in the role, a hint of evil lurking at the back of his eyes as he figures out what buttons he can push with each of them. 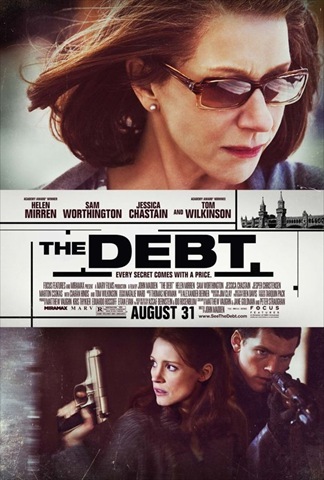 The Debt is an English adaptation of an Israeli film, Ha Hov [literally, The Debt], written by Matthew Vaughn & Jane Goldman and Peter Straughan. Based on this version, it’s a film that I would very much like to see. In the film’s opening act, we see what happened through Sarah’s book, as read by the older Rachel – which makes the events even more momentous when we watch those past events as they unfold, in context. Over the course of The Debt’s first two acts, the film has the feel of an old-fashioned espionage thriller. Events unfold at a more deliberate pace than most of today’s thrillers and spy movies, giving us a chance to get to know the characters as their stories play out across two periods. The entire cast gives noteworthy performances, though Christensen, Mirren and Chastain are particularly fine. Director John Madden [Mrs. Brown, Shakespeare in Love] seems more at home in 1966 portion of the film. The way he builds suspense in that period feels very like spy movies of that era – like The Spy Who Came In From The Cold, or The Ipcress File – utilizing character development, lighting, setting and music as an integral unit with one purpose: to keep an audience on the edge of its seat. As revelations come, and the film settles back into 1997, though, The Debt noticeably picks up the pace and becomes a more conventional thing with its race against time – just being played out with an older than usual cast. Still, even without its ethical/moral undercurrents [can anything good be build upon a lie? ], The Debt remains a solid, involving movie that holds our interest until the final revelation. It may even be the best film to transition us from summer to fall and awards season, with its combination of entertainment and suspense and substance. It’s just a shame that it didn’t shift gears so completely in the final act. Previous PostRichard Dean Anderson To Make Guest Appearance on The FOX Comedy, Raising HopeNext PostNCIS: Season Eight and NCIS LA: Season Two – Great Shows; Unequal DVD Features! “The Debt” is a remake of a 2007 Israeli film about a trio of agents who go to East Berlin in the 60’s to capture a Nazi war criminal. Parts are thirty years later with the daughter of two of the agents publishing a book about the capture. Movie jumps around so can be confusing. Good performances. Better title would be “The Truth”.